Acting expeditiously to realize one of the largest, and most ambitious, elements of its $500-million capital campaign, the Harvard Kennedy School (HKS) goes before the Cambridge Planning Board on Tuesday, October 7, for review of an extensive program of new construction—and, in parallel, reconfiguration of much of its current campus. In discussing the campaign plans last May, Dean David Ellwood spoke about “creating a campus that amplifies our mission.” This involves the creation of new spaces, including (it was reported then) a new building and the reworking of existing spaces to support “active, engaged learning, and group work.” In fact, the overall plan, shown above, involves construction of three significant new buildings; elevation of the current courtyard, which descends well below street level from the current vehicular entrance along Eliot Street (to the lower left in the rendering); and linking much of the campus through common and support spaces beneath the new courtyard grade. 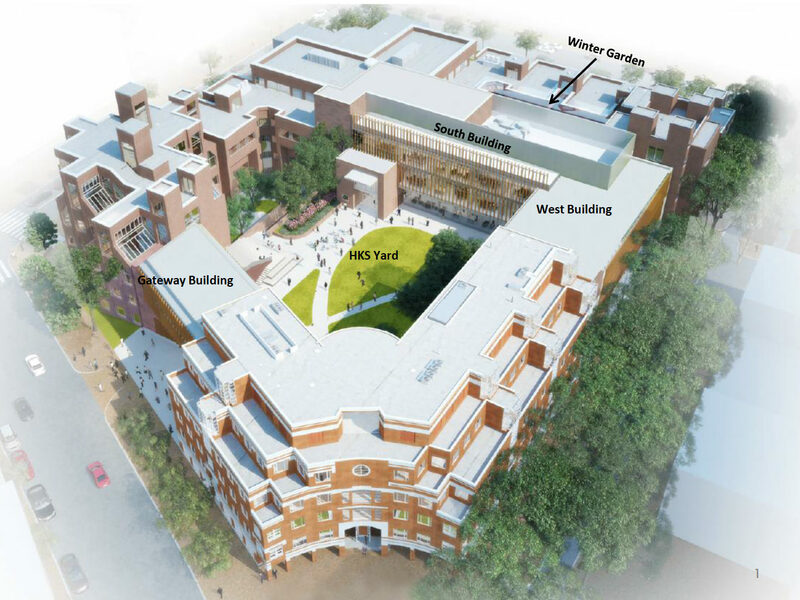 a new “Gateway Building”: a two-level addition connecting the existing Taubman Building (bottom center in the rendering) and Belfer Center (upper left) at the third and fourth floors. This addition will contain faculty offices and meeting space while maintaining an open two-story pedestrian entrance to the campus from Eliot Street—in effect, it is a bridge structure over the reconfigured opening from Eliot into the campus courtyard. the new “West Building,” a four-level addition connecting the existing Taubman Building with the David Rubenstein Building (upper right). This addition fills an area that is now 13 parking spaces, alongside a blank wall that rises up to the level of the pedestrian walkway between the HKS campus and the Charles Hotel complex (the treed area diagonal right in the rendering). The new building will contain classrooms, meeting spaces, faculty offices, and building-support spaces, and—invitingly—provide a new entrance to the campus and the regraded courtyard (from the existing pedestrian connector that runs down to the riverfront JFK Park). the largest element, the new “South Building,” a four-level addition connecting the existing Littauer Building (center and upper left, the familiar façade facing JFK Street) and the proposed “West Building.” This addition will contain classrooms, meeting spaces, faculty offices; new campus kitchen (underneath the new courtyard level) and dining facilities, and building-support space. This building comes out into the existing courtyard space significantly; it will encompass a landscaped, glass-roofed courtyard space (a so-called “winter garden”) between Littauer and Rubenstein. As shown in the rendering, there is a significant new entryway into the South building: a much more logical, inviting way from the raised courtyard into the Forum space in Littauer (access is now through crowded corridors, an awkward stairway, and in some cases, a freight elevator). Executive dean John Haigh explained the program of design, building, and rebuilding as the result of comprehensive planning for the capital campaign that focused on the student experience; more effective teaching; and more collaborative research. The school has sought “classrooms that support teaching that brings more experiential and problem-solving activities” into its pedagogy, he said. The planned program creates six new classrooms (including one for executive education, in the lower level of the Taubman complex), and other flexible meeting spaces. It also seeks to overcome the campus’s “eclectic” spaces, as he termed them—separate buildings that do not integrate into a unified whole conducive to interdisciplinary collaboration or even casual corridor conversations. As an aspiration, Haigh said, HKS leaders and planners hope to have a campus that conveys the sense that “our job is to facilitiate public discussion on the major public issues of the day” (as the school did earlier this week with presentations by former U.S. Secretary of the Treasury Henry Paulson and Vice President Joseph Biden). A reconfigured physical plant that is more accessible to pedestrians and less subject to vehicle traffic should be “welcoming and open, more of a public space” within a “cohesive campus,” Haigh said. The architect for the project is Robert A.M. Stern (who also designed Harvard Business School’s traditional Georgian brick Spangler Center). The landscape architect is Michael Van Valkenburgh (profiled in “The Urban Landscaper,” Harvard Magazine’s November-December 2013 cover story). If their vision is realized, the elevation of the courtyard will make it possible to create a vehicle entrance at the Eliot Street side of campus, so that trucks (or cars transporting visiting dignitaries) can descend below the new courtyard surface—making the space a pedestrian zone. (The loading dock, secure visitor entry, and support services, such as a large kitchen, would be at the current courtyard grade level, and thus beneath the new, elevated courtyard surface. The vehicle entry would be to the left part of the Gateway Building as shown on the rendering above.) The first floor of the Gateway structure bridging the open entry to the courtyard would be a student lounge, lit so as to enliven Eliot Street; the level above would be offices and collaborative space. The large South building has an open space out front, and then glass walls through which the interior winter garden can be seen. The glass also admits light to the new, large dining space (constructed at the current level of the courtyard). The West building, like the Gateway, incorporates an open pedestrian way, and thus, in part, acts as a bridge. The first floor above the bridge is classroom space. Above it is a flexible, reconfigurable set of conference and other rooms. Because the courtyard grade is being raised, visitors who have long entered the Taubman building, only to have to descend stairs to the courtyard, will have a different experience in the future. When the construction is done, they will be able to proceed on the Eliot Street level straight out to the elevated courtyard. On the lower level, besides the new executive-education classroom, they will be able to access a corridor that extends through the West building to the South building and the new dining facilities. The courtyard itself will have various constructed, tiered spaces for seating, conversation, social gatherings (popular among executive-education students during the summer months), and even events—not unlike the feel of the Forum space within Littauer. As Haigh explained, the project is about re-envisioning how the campus, and therefore the school, function. The planning documents refer to “decompression.” Growth in enrollment is not anticipated, he said. Some faculty growth is envisioned in the capital campaign, but that is not a major element driving the extensive reconfiguration planned. The construction adds 77,000 square feet of new gross floor space (plus the areas beneath the elevated courtyard)—expanding the existing footprint (some 241,000 square feet) by more than 30 percent. Realizing the full program will be a significant investment: the estimated cost exceeds $100 million. The school aims to fund the entire project with philanthropic support, Haigh indicated. Fundraising is well along, but not complete. Assuming timely regulatory approval and success in securing the remaining financial support, preparatory work in the courtyard could begin next spring, with heavy, disruptive construction fast-tracked after Commencement. In anticipation, the school has already built classroom swing spaces in the nearby One Brattle Square building, and is preparing offices for faculty and staff members and some of the schools many visiting fellows. If all goes well, people could begin moving into the new spaces by the fall of 2017, with the project completed by the beginning of 2018. Its sweeping, campuswide nature almost guarantees that the project will cause short-term disruptions; but the result, if realized, would be a more tightly integrated campus than the Kennedy School, built in discrete phases beginning in the late 1970s, has ever enjoyed before.